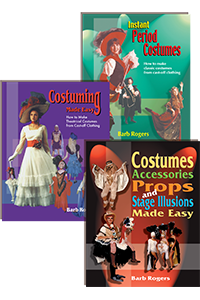 Barb Rogers’ creativity rises to new levels in her latest book, which takes her concept of conversion costuming and also applies it to accessories, props, and illusion costumes. While still dedicating a complete section to costuming, you’ll especially love learning how to accessorize your show without starting from scratch: hats and headpieces, masks, wings, jewelry, and much more. The props section covers armor, thrones, dinnerware, Native American props, and more. Read more...Finally, you’ll love how her simple creativity can allow you to create illusions such as a head on a platter or a person riding a spider! Barb Rogers claims that anyone should be able to make a wonderful costume using her method of conversion costuming. With the secrets she shares in this book, you don’t have to go through the work of making costumes from scratch. Instead, create fabulous, unique costumes for your needs with very little money, time, or expertise. You just need an imagination and the willingness to hunt the thrift shops, garage sales, and discount stores for that perfect item you can convert into a costume. To help you, this book includes over 100 costume designs with photos and diagrams for standard theatrical characters such as princes, princesses, clowns, witches, elves, medieval ladies, cowgirls, and colonial men and women. In addition, this valuable text provides complete costume guides for a dozen Broadway classics, including Annie Get Your Gun, The King and I, Pirates of Penzance, and My Fair Lady. If your motto is “never sew if you don’t have to,” you’ll love this book! Why spend a small fortune to rent expensive period costumes when you can create them yourself for less than a day’s rental price? Make them the easy way from cast-off clothing... without sewing! This valuable resource presents the concept of “conversion costuming.” The first rule of thumb is that you must put aside your preconceived ideas about how to make a costume. The world of conversion costuming is miles away from fabrics, measuring, pinning, cutting, and sewing. The most important tool you need is your imagination. To help you, this book includes over 65 ingenious costumes designs with photos and diagrams for many periods from Egyptian, Greek, and Roman all the way to Punk. These conversion costuming ideas will save you time, money, and deadline disasters and give you precisely the costume you want. From ’20s to ’80s to Old West to Renaissance, put aside the boring and mundane part of costuming and go right to the exciting and creative part! SPECIAL OFFER! Buy all three books for $47.00!